Swedish photographer Jonas Ingerstedt specializes in interiors, and his list of clients includes Kinfolk, H&M Home, Villeroy Boch, Elle Decoration, Residence, and IKEA, among others. Several pictures from his portfolio were featured on Nordic Design in the past (such as here and here) – He is very talented! He has that special way to capture the light… His impressive work is characterized by lovely colours and great composition. Simply gorgeous. 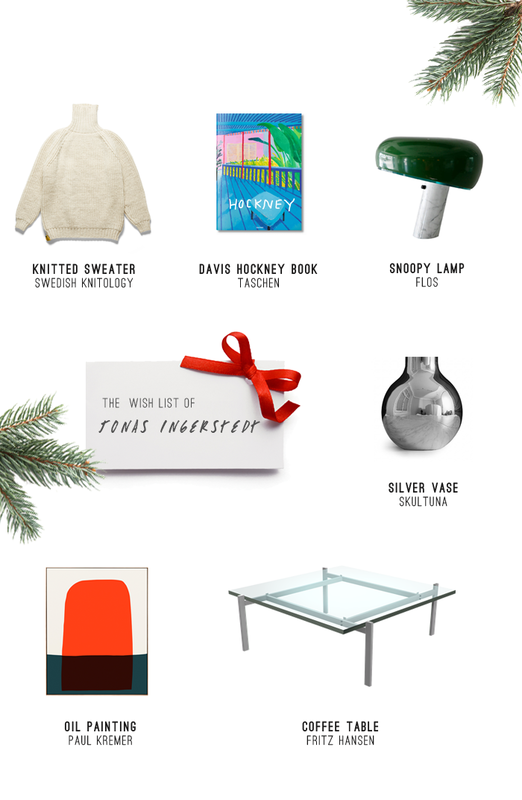 I’ve reached out to Jonas for him to take part in this post series, along with Danish accessory designer Yvonne Koné, as well as photographer Line Klein and blogger Allan Torp (both coming soon), to find out what’s on his wish list for Christmas. And here it is! All source after the jump.